Are you afraid to sit by the campfire and listen to ghost stories? 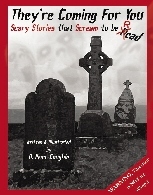 Does hearing a scary story make you sleep with the nightlight on? If so, then you’re not ready for this book. Sorry, this book is for ages 9 and up – and it’s not for wimps. But if you’re sure you’re ready for them, these stories will tickle your scary bone and give you “da chicken skin.” Cemeteries, voices without bodies, and other creepy things in the dark will leave you begging for more. That is, if they haven’t already gotten you yet. The author, O. Penn-Coughin (a play on “open coffin”), is originally from Argentina, and he has blended some of his own culture into several of the stories. But he is kind enough to translate any of the Spanish words he uses, so none of the meaning is lost. A natural story-teller, he shares these stories with classrooms, and is available for speaking engagements. Read this book if you dare. Oh, and don’t forget to SCREAM!